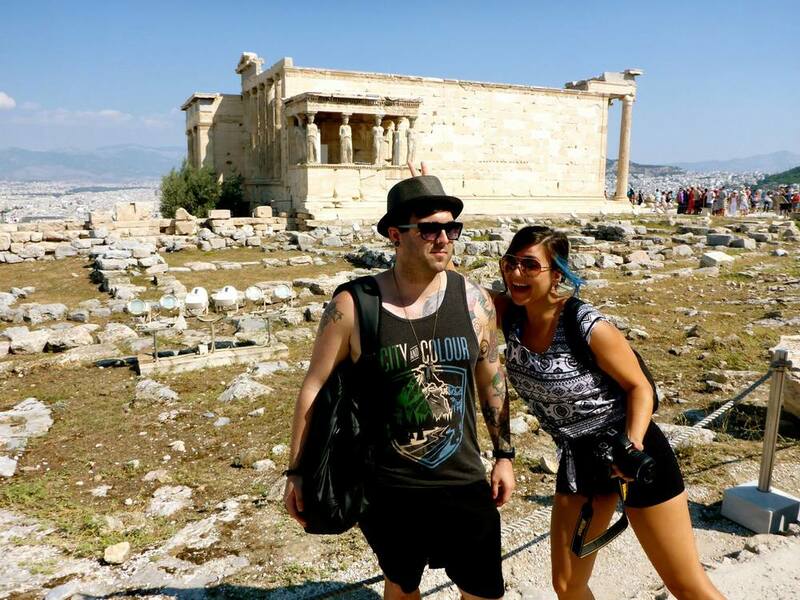 Athens was a fascinating journey into some of the most ancient standing structures that exist in this world today. Here is where great art, architecture and culture collided not only in the past but still today. Sweeping city views were abundant from the top of the Acropolis (my favorite site to visit in Athens) to the top of our hotel, the Poseidon, which also lined a private beach at the edge of the city. After a long sweaty day of sight seeing, it was great to retreat to the rooftop hotel pool and bar. Views from the top of the Acropolis were stunning! Our first Greek dinner in Athens was one to remember. We were guided through the cobbled winding streets toward the parthenon. Lights from open souvie shops and tiny bars spilled out onto the street, guiding our path. At last we reach the bottom of a wide and tall set of stairs. When looking up one could see the orange and yellowish glow of the parthenon. All along the steps were bars, cafes, and restaurants with tables not just inside but outside the business on the actual steps. The steps were crammed with people! At Geros Tou Moria (Plaka neighborhood) we were entertained by a group of traditional Greek dancers and singers as we ate. A small group of our numbers were even pulled up to join the dancers! It was great fun, even if we were all a little jet lagged! Some quick and dirty pointers on a few Greek phrases you should know before you go! Yasas! -- a way to say "hello!" Neró, parakaló -- "Water, please!" For all those raging nights out, this was a life safer. The locals loved that I asked in Greek and were speedy to respond. I even was asked twice if I was really Greek! Opa! and Yamas! -- Most people like to use the popular phrase "opa" as a form of cheers to kick back those drinks. But to do it the real authentic Greek way, you would say "Yamas", Yamas means "to your health". Opa is a phrase equivalent too "Oops!" or "Hey!" which is why you'll remember hearing it during a dance at a Greek wedding or after someone drops a plate (intentionally or unintentionally) in every Greek movie in existence. Parakaló and Efcharistó -- Please and thank you! Momma always said mind your P&Qs. The accented o's have all the emphasis and the "ch" is that back of the throat "ha" like you would hear in Hebrew speakers today, but not quite as harsh. This woman captured my attention and I was absorbed into her world but for a brief moment. My first day in Athens, sitting on the beach and looking out. View from the rooftop of our hotel. Beach vs. City. In front of the Olympic stadium with my new Kiwi love, Charli. Stray dogs can be found everywhere in Athens. Most live in apartments and buy them as puppies and when they get to big they let them loose to roam the streets. i believe there is an organization that makes sure these dogs are fed and watered. I mean to look more into this! It's really amazing how something so large can come from so far back in history when so little technology and big machinery was available to them. Just look at the size of this thing! The view is getting better and better as we make our way up. Being cheeky as the Caryatids stare down on us in the background. Fun at the top of the crop. You can see all of Athens from up here! The city’s highest vantage point (970ft), capped by a tiny, whitewashed church, a restaurant and café. The famed marketplace of Agora in Socrates and Plato's day was the heart of public life, and among the site's extensive excavations you'll find temples, a concert hall and long, colonnaded arcades. That's the temple of Zeus we visted earlier out there! From the top of the Acropolis with the city of Athens behind. Ready to see more of Athens by foot! I felt this lady embodied her culture so well I felt I had to capture her to remember her. I love this photo. A very popular district in Athens. Just around the corner from the Plaka District. On our way to City Hall. Let the changing of the guard begin! Caught the changing of the guards ceremony at City Hall. I had perhaps 2 of these, at minimum, every day. There's a giant ice cube at the bottom - it's a whole new spin on an iced cap. After a hot and sweaty day of touring, this is how we relax. All the girls join in, we are fast friends! Nothing is better than a rooftop pool with the city of Athens sprawled out behind us. As the sun sets on our first day, we couldn't feel more content. Ready for our first night out in Athens! Souvie shops light up the streets as the sun sets on our way to dinner. The night is vivid and alive with people and lights as we make our way to dinner that first night. First night in Athens together. That crowded stairs below the parthenon as we walk home from dinner. Outside with beautiful Mariah where we ate our first Greek dinner. Complete with dancers!